We've been back from our Palembang/Bangka Island trip for two weeks now, so it's about time I stopped letting myself be distracted by emails, proofreading, Skype, Facebook, Paul Krugman's incisive but depressing commentaries on the US economy. I've even been to the gym, and I dislike that more than blogging, which I'd say is probably on a par with ironing: not unpleasant but without the appeal of a good crime novel. My first photo actually comes from the afternoon before we took off. I had packed my blister sheets of statins and bp medication, so I left the two pills I would need before departure out on the nightstand. When I came back to the apartment, I found that they had been tidily rearranged by housekeeping on a paper coaster. So unlike the life we're used to. I had been to Sumatra twice before, once about 25 years ago on an appropriately girls-only trip to the land of the Minangkabau, one of the world's few matrilineal societies. That time my friends and I flew to Medan, in the far north of the island. On the second visit, circa 1993, the Welland family (despite the resistance of Iain, morose in the memorable way only a 16-year-old wrenched from his friends can be) landed in the southern city of Lampung. While Iain stayed in the hotel room and communed with the angst-filled music percolating through his headphones, Michael, Kate, and I took a small boat out to Anak Krakatoa. We were lucky enough to be showered with ash and cinders, as the volcano obligingly performed for us. Our 2011 Sumatran adventure didn't involve Minang culture or eruptions. This time we flew to Palembang, also in Sumsel (which I eventually deduced, after failing to find the term in my pocket dictionary, was Sumatera Selatan or South Sumatra). Michael had been asked to give a talk at Sriwijaya University, so he decided to tack on a sand-related excursion to the beaches of Pulau Bangka, between the South China Sea to the north and the Java Sea to the south. Our Garuda flight was mercifully uneventful and Palembang airport surprisingly sophisticated, certainly in comparison to our Ryanair arrivals and departures from Perpignan. Palembang has claims to being the oldest city in Indonesia — disputed, needless to say — and is presently also (in)famous for the Nazaruddin graft scandal over construction of facilities for this November's Southeast Asian Games. It's a rare day when the Jakarta Globe doesn't have an update on charges and countercharges between the fugitive politician and the ruling party of which he was once treasurer. History is everywhere in Palembang. I mentioned that Michael was to speak at Sriwijaya University (it's also the name of one of Garuda's rival airlines). 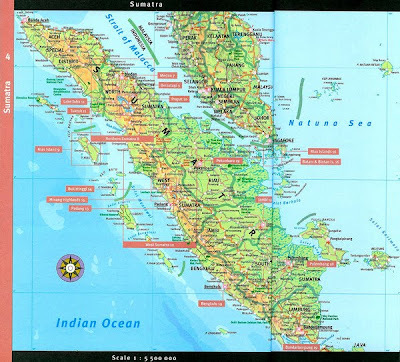 The Sriwijaya empire was a seafaring Malay society, based in Sumatra, that dominated the area between the 7th and 14th centuries CE, extending at times as far as Thailand and Cambodia. Dates are vague, because this is a lost empire, not even known to the inhabitants of its center, Palembang, until 1918 when a French historian uncovered enough evidence to infer its existence. Since then a number of archaeological finds and references in old Chinese documents have corroborated the theory. Sumatrans welcomed proofs of this powerful Buddhist empire as a counter to Java's pride in its Hindu Majapahit heritage, which waxed as the Sriwijayan waned. Islam, through conversion driven by trade, replaced both Hinduism and Buddhism in Indonesia, with the exception of Bali, which remains Hindu. Islam arrived from Gujurat and was "soft," a less puritanical form of the religion than that which came later from Mecca. As Majapahit rule in turn weakened, Palembang became a sultanate, its most famous leader Mahmud Badaruddin II, who fought both Dutch and British colonialists during the first two decades of the 18th century. He eventually lost, but won three major battles in the process. As we discovered at the museum named after him (day 2), he is not only remembered via Palembang's Sultan Mahmud Badaruddin II airport (originally built by the Japanese during WWII occupation), but features on the Rp 10,000 note. We've seen his image countless times, but never registered the name in small print or knew the history. Now that I've clarified this bit of history for myself, I'll get on with our actual visit, starting with food. We were staying at the Aryaduta (Ambassador) Hotel. The room was pretty basic, but we loved the fish the dining room served. We had been told by Eky, one of our favorite members of the R-C housekeeping team, from Padang, Sumatra, further north and west, that we had to try pempek, molded from a mixture of fish and tapioca. The hotel's version was a little solid, so I think we need to experiment more to find the pempek that has put Palembang on Indonesia's culinary map. Eky said that pempek makanan khas Palembang is the best, but we never got to sample this. The cuka that accompanied our lunchtime pempek — a dark vinegar dipping sauce with garlic, chili pepper, and brown sugar — was delicious. Michael's fish soup, spooned from spicy broth onto rice. My ikan bakar (barbecued fish), blackened so that it reminded us of Cajun-style dishes. We ordered a version of this at every Sumatran meal during our stay. Shopping time. We took a hotel taxi to Jalan Ki Gede Ing Suro, recommended by the Rough Guide as a songket center where you could both buy textiles and watch them being made. Palembang's other celebrated craft is deep red, black and gold lacquerware [I had never made the connection between "lacquer" and "shellac," both words deriving from lac, the Portuguese term for insect-produced resin], but we had limited time and never made it to the shop Mekar Jaya at 45a Jalan Slamat Riady. Address is included here in case Michael has any spare time during future trips to Palembang once drilling has begun. I can already see him rolling his eyes at this idea. Back to songket. What I am actually enchanted by are old songkets, where both the characteristic gold threads and the strong colors have faded over time. Here are some examples found at Pigura in Blok M back in May when a board member's wife was visiting and she was hunting down a replacement for a piece that was lost in a house fire. Libby was very lucky. The owner's parents had collected for years and recently bequeathed their collection to their son, who was selling rather than saving. I see this mend as evidence of decades of wear at ceremonial occasions: a reason to buy not to reject. These songkets are so treasured that they are sometimes cut in half to share between children as an inheritance. On Jalan Ki Gede Ing Suro we were looking at new songkets, not antiques. Since we also like to support contemporary craftsmen (or, with weaving, most often craftswomen), this was no problem. We were privileged to see the backlooms in operation. A complete songket, with sarong and selendang, takes about a month of eight-hour days to finish. Chandra had advised Michael to stop by Galeri Zainal Songket for an authentic piece of good quality weaving (for the future: Zainal has another shop in Palembang, Galeri Z. Arifin: Tenun dan Batik, at Jalan Keranggo Wiro Santiko No 279 — and also a gallery in the Aryaduta Hotel). Cheeky lads playing outside the shop. Stop #2, Fikri Koleksi, just down the road. I was hoping to find a combination of pelangi (rainbow) dyeing and interwoven gold thread (Palembang comes from pa, place, and limbang, to pan for gold). Tidak ada, but we did come across a hard-to-find grey and gold combination; Michael spotted the three-piece blue batik. These look quite irresistible in the photo, but in reality they were very bright. Now, however, I'm having second thoughts. Perhaps I shouldn't have been so conservative. And the women who magically (in the view of someone like me who has to keep checking on the difference between warp and weft) create these marvels by hand. Purchases. I really must start ironing textiles before photographing them. That night we joined Olivia and Weka for an excellent Chinese dinner at the Hotel Horison. We were all guests of the hospitable Pak Gunawan from BPMIGAS, second from the left in the group photo. Weka, by the way, is an enthusiastic Star Wars and GI Joe collector. Such a shame we don't still have all those action figures and vehicles that Iain amassed in his childhood. Two other geologists, Dr Abdul Muin and a late arrival, whose name I unfortunately didn't catch. Pak Muin is based in Jakarta, so Michael is hoping to see more of this erudite and gracious fellow scientist.